Yellowstone National Park is a natural habitat for Brown Bears, also known as "grizzlies". Their nickname dates back to the Lewis and Clark Expedition. Grizzlies (ursus arctos horribilis) are the largest bears in Yellowstone, weighing from roughly 300 to 600 pounds or more. They live 15-20 years in the wild. 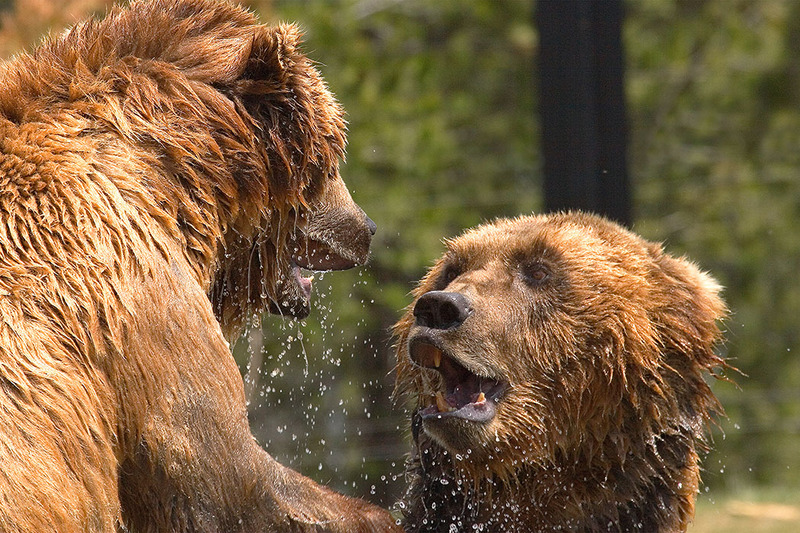 This photograph captures a rare look at grizzly behavior. The suspended water beads, tossed around by play "fighting" in a shallow stream, emphasize the intensity of the moment. This photograph was awarded first place in the 2007 National Wildlife Federation's annual Contest.